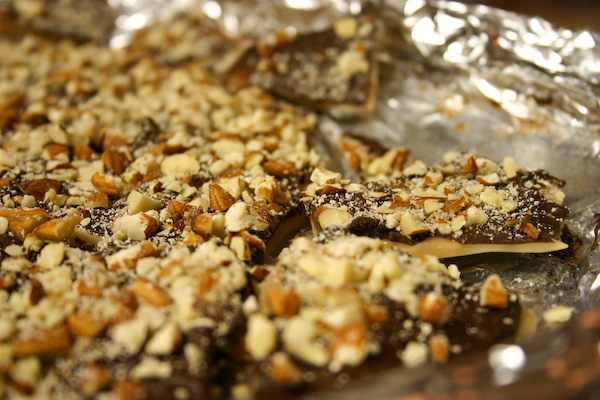 Homepage / candy / Homemade English Toffee. 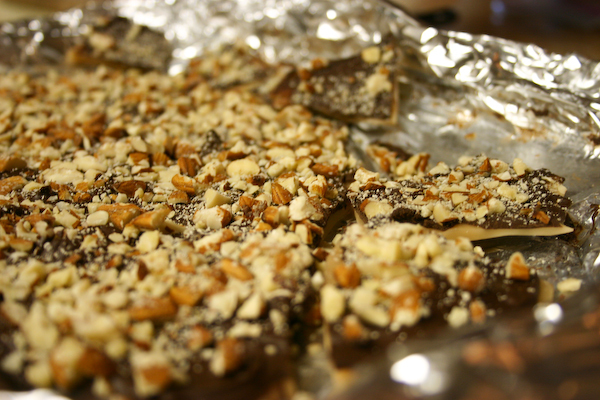 A few mornings ago I woke up to my mom making homemade English toffee. That’s how you know it’s going to be a good day. sugar cookies for breakfast and stalking you with my camera and annoying questions. Til she leveled me with a dirty look. 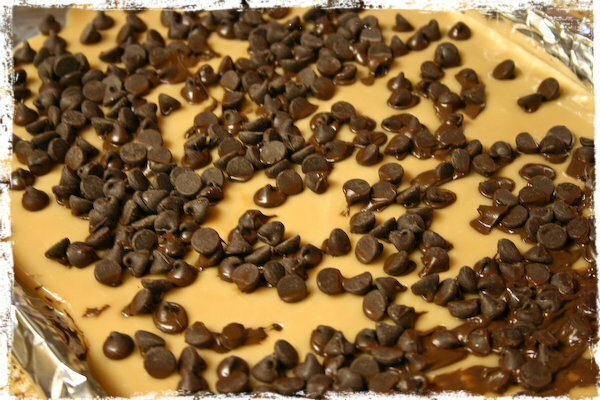 Apparently saltine crackers is “not the same thing” as hot sugar and butter magically stirred into sweet, rich, delicious homemade toffee. Who knew. I want to live inside this picture. That’s probably why back in the day (it was a Tuesday. Just kidding. It was 1974.) 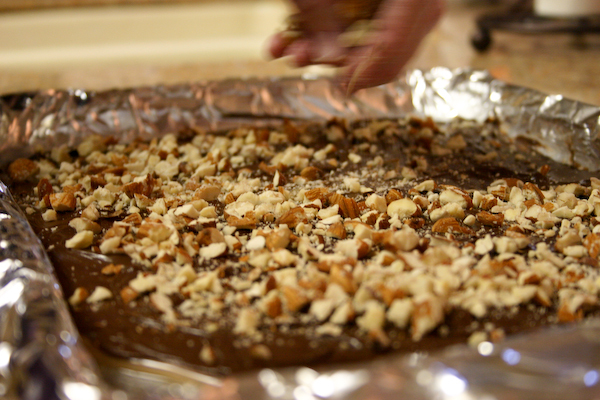 it was called butter crunch. 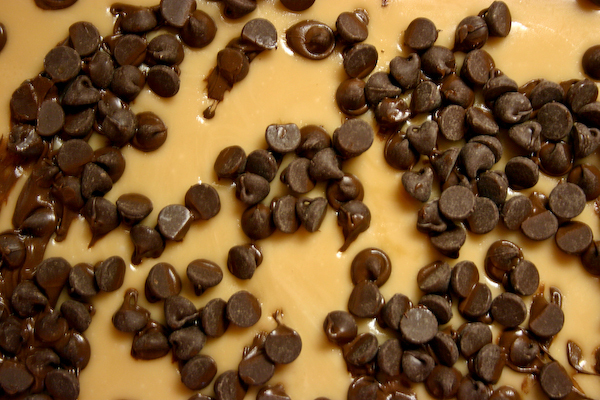 Line a jelly roll pan with aluminum foil; butter foil or spray with cooking spray and set aside. 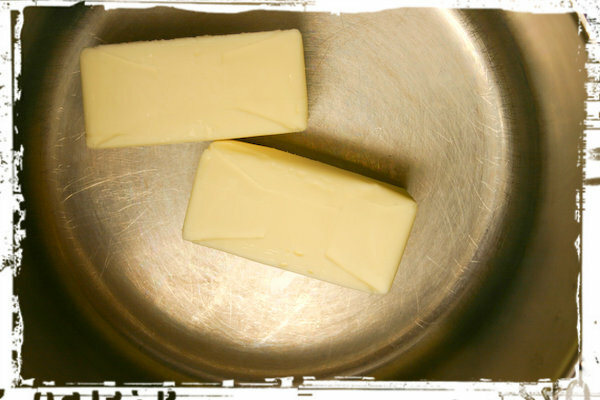 Melt butter in a 2-quart saucepan over low heat. 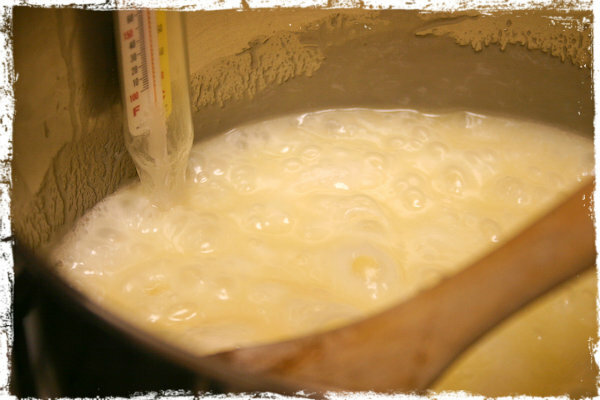 Add sugar; heat to boiling, stirring constantly. Stir in water and corn syrup. 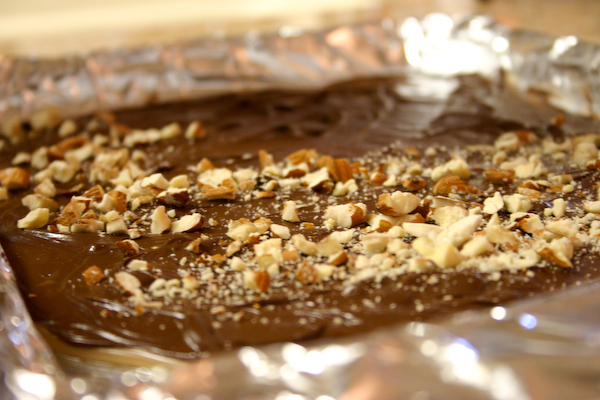 Cook over medium heat, stirring constantly, until 290°F on candy thermometer. 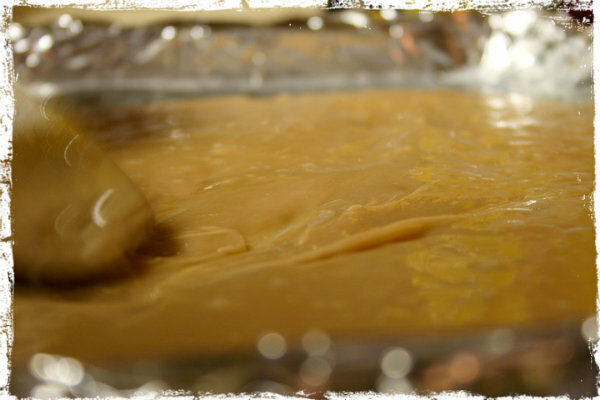 It’ll start to thicken up and turn a light brown toffee color. Remove from heat. 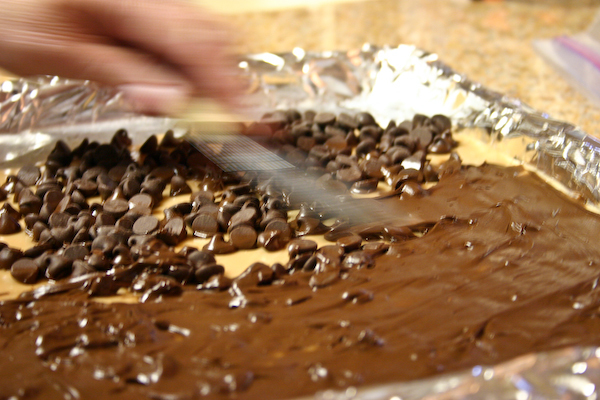 Pour onto baking sheet and spread about 1/4 inch thick. 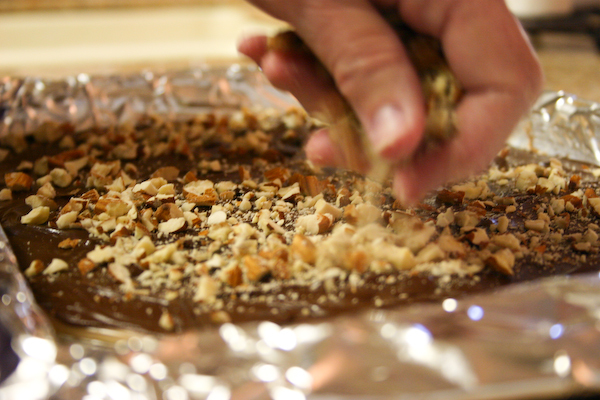 … and gently spread over the toffee as they start to melt. Allow to cool completely. When firm, break into pieces. 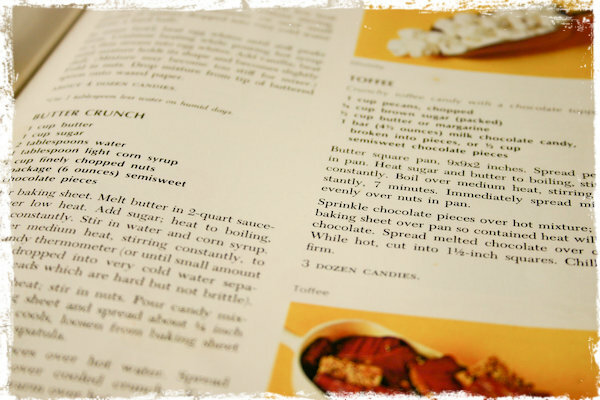 Source: Adapted slightly by my mom, from Betty Crocker’s Cookbook, 1974. Previous post Cut-Out Sugar Cookies with Vanilla Buttercream + An Annoucement. Next post Cinnamon Sugar Cookies.